The population of the Michigan Territory in 1805 was 4000; 1810 was 4762; 1820 was 8765. The opening of the Erie Canal contributed to the population swelling to 31,630 people by 1830. Michigan gained statehood in 1837 and the population boomed to 212, 267 with many migrating from New York and New England areas. The first Michigan constitutional convention was held and controlled by New Yorker's because so many people who were born in New York migrated to Michigan. Although Michigan was growing as a state with Americans, it wasn't growing with many foreigners. State Senator Edwin M. Cust thought it was time to encourage foreign born people to immigrate to Michigan. He asked for the establishment of a Foreign Emigration Agency in 1845. Governor John S. Barry signed the resolution on 24 March 1845. The resolution allowed the Governor to appoint an agent from the "1st day of April to the 20th day of November" for the purpose of encouraging immigration. Money could be used from a contingent fund, not to exceed $700, for costs of setting such an agency up. This agency was in New York. Michigan continued to fund an agency from 1845-1880. One such agent, Maximilian Allardt, was appointed to open an office in Germany. Allardt left in August of 1869 to recruit and bring back Germans to work and live in Michigan. Allardt produced an eight page magazine, "Der Michigan Wegweiser", the Michigan Guide, to sell people on everything Michigan had to offer. The first issue was published in 1870 and the last issue in 1875. This magazine was distributed free of charge in Germany, Bohemia, and Hungary. William L. Jenks wrote an article titled, Michigan Immigration, that was featured in a 1944 Michigan History Magazine. This article provides an excellent history of the immigration offices and agents. What does this mean for genealogists? Records, oh those glorious records! From 1869-1874 the agents created Governor's Reports, which are available at the Archives of Michigan, in Box 243, Records of the Executive Office. This record group contains documentation of Allardt's marketing strategy, recruitment materials, and travel plans from his time in Germany. Passenger lists may be included with some of the reports. John Reisig and John Hemmeter worked with Allardt, even traveling from Europe with the recruits. Tip: If you are having trouble finding your ancestor who immigrated to Michigan at this time, use one of these gentleman's names on the passenger list and then search the passenger list for your ancestor. I have wondered for some time if my great grandfather, Johann August Fredrich, was recruited to come to Michigan and work in the timber industry in Manistee County. I didn't know much about how recruitment worked until I attended Ceil Wendt Jensen's "Immigration Agents" presentation at the Abrams Foundation Family History Seminar, in Lansing Michigan. One of Ceil's slides showed the area of the German Partition of Posen and the villages in the area my Fredrich ancestors came from was there: Bromberg. Ceil gave a wonderful talk, filled with resources for futher research. Ceil planted the seed in my head and I spent time conducting background research on Immigration Agents. 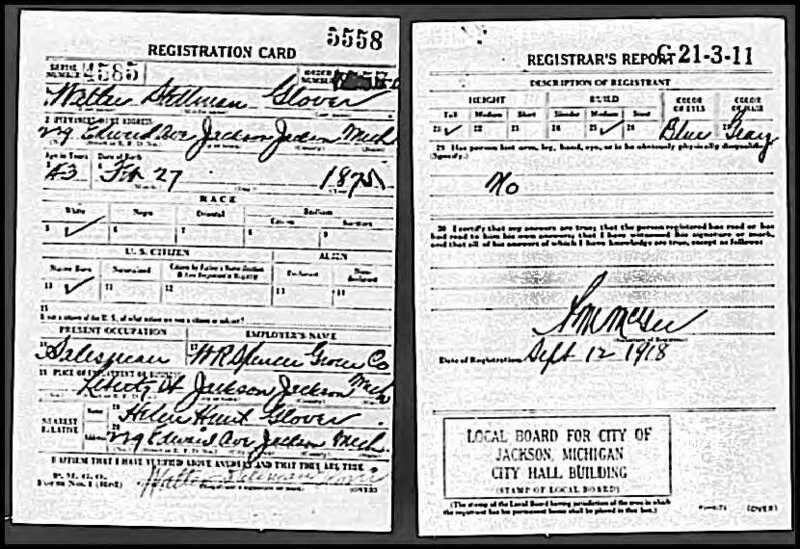 Was my great grandfather recruited to come to Michigan? Check back to find out! Agents of Change by Ceil Wendt Jensen, Ancestry Magazine, Jan-Feb 2010. Found at Google Books. American Settlers Guide-Found at Google Books. Germans in the Middle West, archived article at JSTOR. “Michigan Immigration” by William Jenks, Michigan History Magazine, vol. 28 (January-March, 1944), p. 67-100. Michigan: seine Vorzuge und Hulfsquellen (Michigan Its Superior Attributes and Resources)(Allardt's Magazine) Ceil found it through World Cat and requested through interlibrary loan. Settling the Great Lakes Frontier: Immigration to Michigan 1837-1924 by C. Warren Vander Hill, Michigan Historical Commission, 1970. Department of Conservation, Lands Division. Applications for homestead from the German Christian Agricultural and Benevolent Society, 1867. RG 60-8, Box 49. Carlson, Harold. “A distinguished 48’er: Eduard Dorsch.” Michigan History Magazine, vol. 19 (1935), p. 425-437; vol. 20 (1936), p. 411-412. Committee of 1930. The hundredth anniversary of the arrival in Detroit of the organized immigration from Germany, 1830-1930. Detroit, 1933. Edinger, Dora. “Christian Esselen: Citizen of Atlantis.” Michigan History Magazine, vol. 34 (1950), p. 133-143. Frank, Louis. German-American pioneers in Wisconsin and Michigan. Milwaukee, 1971. Graff, George. The People of Michigan. Lansing, 1974. p. 40-46. Kennedy, J. B. “Herman Kiefer.” Michigan Pioneer Collections, vol. 20 (1915), p. 397-403. Kistler, Mark. “The German language press in Michigan.” Michigan History Magazine, vol. 44 (September 1960), p. 303-323. Kistler, Mark. “The German Theater in Detroit.” Michigan History Magazine, vol. 47 (1963), p. 289-300. Neidhard, Karl. “Reise nach Michigan.” Michigan History Magazine, vol. 35 (1951), p. 32-84. Peano, Shirley. “Pioneer Germans in Marquette County.” Harlow’s Wooden Man, vol. 9 no. r (Fall, 1973). Russell, John. The Germanic Influence in the Making of Michigan. Detroit, 1972. Suelflow, Roy. “Lutheran Missionaries in the Saginaw Valley.” Michigan History Magazine, vol. 51 (Fall, 1967), p. 226-240. Suelflow, Roy. “The Planting of Lutheranism in Detroit.” Concordia Historical Quarterly, vol. 39 (July, 1966). Ten Brook, Andrew. “Our German immigrations.” Michigan Pioneer Collections, vol. 26 (1894-95), p. 241-255. Zehnder, Herman. Teach my people the truth. Frankenmuth, 1970. 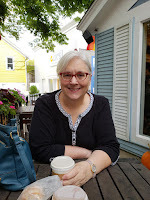 My big genealogical adventure this summer was traveling to Florida to my son's wedding, which was a great trip, but one that I didn't do any research on. I haven't had time to do any research trips. I did have the opportunity to attend a seminar, the Abrams Seminar, held in Lansing Michigan in July. The Abrams Foundation Family History Seminar, hosted by the Archives of Michigan and Michigan Genealogical Council, featuring Michael Lacopo was great. One of the greatest things was that I only had to travel 50 miles to go to it. Day 1 started out with Michigan Genealogical Council board and delegate meetings. The July Board meeting was my first official meeting as a member of the board! I wanted to serve on the board to give back to the genealogical community that has given so much to me in terms of resources, education, and more. I had time between the delegate meeting and the start of the Seminar and I took advantage of that time by having lunch and then sitting outside on the second floor of the Michigan Library and Historical Center, next to the big tree. It was a great place to get focused on genealogy. The Seminar kicked off with a choice of tours: Digitization Tour or Archives of Michigan Tour. I chose to go on the Digitization Tour. This tour was offered for the first time at the seminar and it was very informative. Attendees got to go on a behind the scenes tour of the digitization process at the Archives. Two afternoon sessions were offered with six options for seminar attendees. I like to choose my sessions by what will further the research that I am conducting at the time. I chose Researching Your Family History at the Archives of Michigan with Kris Rzepczynski for two reasons. One, I have done limited research in the Archives and figured this would motivate me to do more. Two, I felt I could share my knowledge at my local society meetings. Kris did an excellent job of explaining the resources available at the Archives. Some of my readers may remember a few years ago when the Abrams Foundation Historical Collection was moved from the Library of Michigan to the Archives of Michigan. Most of the Abrams Collection can be found in the open stacks in the Archives Reading Room. My second choice was a little harder decision to make. I could easily have gone to any one of the three. I chose "Chasing Your Elusive Ancestor" on the Internet by Karen Krugman. I have a few elusive ancestors and thought I could benefit from Karen's talk. This was my first time hearing Karen speak and she is a character. Her presentations are filled with great advice and humor. Have you met Mr. Brown Eyes? Karen went over Search Engines, Types of Searches, Websites, Tips for Searching and more. The first day ended with a Lock In at the Archives of Michigan for those who preregistered for it. I was one of the lucky ones who got a spot, but about three days before the lock in, I decided that I couldn't get my research together enough to make the best use of the time at the Archives. I only had one day between coming back from the wedding and going to Lansing. I emailed the Archives and released my spot to someone on the waiting list. Saturday morning I was up early and on my way to Lansing. Michael Lacopo was first up and I didn't want to miss his talk. "Deconstructing Your Family Tree: Reevaluating the "Evidence"" was the topic for the session. Michael provided lots of questions for thought when doing your research, encouraged becoming familiar with the Genealogical Proof Standard, and expressed how important it is to develop an understanding of social history. Many examples from his own research were given. Is it Genealogical? was the take home question for me. Next up was "What's New at Seeking Michigan" by Jessica Harden from the Archives of Michigan. I attended this session to hear what Jessica had to say because my local society, Calhoun County Genealogical Society, is hosting Jessica at one of our programs in the Spring. Jessica walked attendees through the best way to search at SeekingMichigan.org, which I found helpful having gotten frustrated a couple of times there! Her advice was to start at the advanced search feature on the home page, and only search one database at a time. The available databases are found in list form on the right side of the advanced search page. I did learn something new and that was when you are searching Death records, you can click on the column heading to sort the results. Jessica provided other tips for searching military records, census records, Detroit News Index, and more. Overall, a great refresher for me. Lunch was included in the price of the seminar and was catered by Grand Traverse Pie Company, no pie but a delicious sandwich, chips and cookie. The afternoon session started with Michael Lacopo speaking on "More Than the Census"- Our Families Did Exist Between Those Ten Year Intervals! I find Michael such a great speaker that I found myself listening more than taking notes. The syllabus was provided via a Dropbox link before the seminar and I was able to use my tablet to take notes right on the syllabus. I only highlighted one thing and it was "construct a timeline for every ancestor" "Make it a point to know where the person was a ALL times." Great advice. My last session of the day was Ceil Wendt Jensen's "Immigration Agents". I have wondered for some time if my great grandfather was recruited from Germany to come to Manistee county for the timber industry. Ceil's presentation was packed with information and resources to further my education on this topic. One screen shot that Ceil showed was the places that the Immigration agent recruited people from in the German partition of Posen. I don't know where my great grandfather was born, but I know where his sister was baptized and that village was on the list. I am not going to go into any more detail as I have used Ceil's resources this past week and found a little more out about the Immigration agents and plan a blog post about it. The Archives of Michigan did a great job with the Abrams Foundation Family History Seminar. I enjoyed going to a more laid back seminar and getting to know more of my Michigan genealogy friends. The day ended with a few of the Michigan Genealogical Council board members going to dinner with Michael Lacopo, Kris Rzepcyznsk, and his guest. 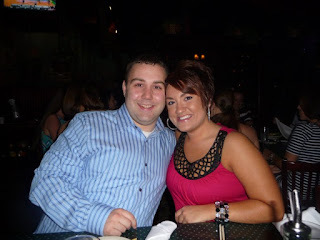 We went to a great restaurant in Lansing, Capitol Prime Steak and Seafood. It was a wonderful ending to a wonderful event. Thank you Kris R. and your staff at Archives of Michigan, my fellow MGC board members and Micahel Lacopo for offering this great resource in my home state. The Abrams Foundation Family History Seminar is offered in July each year. Check it out at Seeking Michigan.org and plan to visit Pure Michigan and the seminar. My son, Travis Kirk Leyndyke married Alayna Jovan DeSalvo, July 4, 2015 at Rosen Shingle Creek Resort, Orlando, Florida. It was a beautiful ceremony and reception. I am so happy to welcome Alayna to the family. Yes, she is already in my database! One of the gifts I gave my daughter when she got married was a memory book, "To My Daughter, With Love". It was something I picked up at a book sale and thought it would be a great wedding keepsake. My son announced his engagement and I started looking for a memory book to give to him. 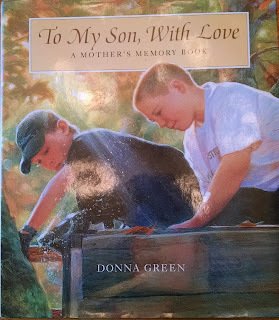 I never dreamed I would find the same book, but for a son. 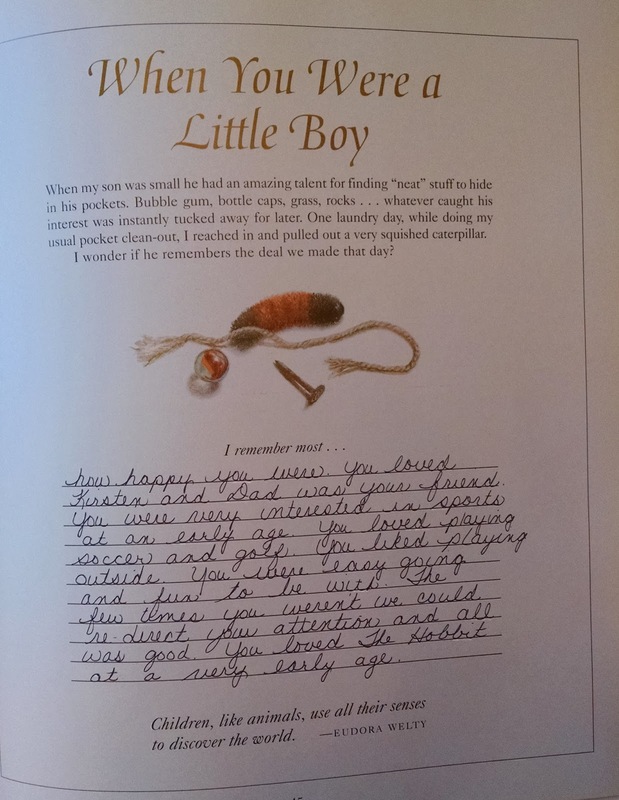 To My Son, With Love-A Mother's Memory Book is filled with journal like prompts to record my cherished memories of the days my son and I have shared. The beautifully illustrated book has three sections: About Our Family; About Myself; and About My Son. The About Our Family section starts with listing grandparents, interesting ancestors and family traits that have been passed down to my son. It continues with memories of my mother and father, family traditions, special places, family memories, and more. The About Myself section starts with 'The Day I Was Born' and includes lots of memories. Memories about my childhood, homes, schools, friends, daydreams, boys, passions, marriage, and more. The last section, About My Son, is all about Travis. 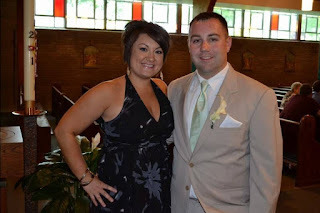 My memories of his birth day, toddler years, when he was a little boy, how he drove me nuts (by not getting out of bed in the morning), games and activities he did, favorite recipe, growing up and letting go, the love of his life, and his wedding day. The book ends with two pages where I can list who was special to him, who encouraged him, who was important to him and more. The above page called "Cooking Up Trouble" has one of Travis' favorite recipes for Mexican Layered Dip. I can't even count the number of times I have made this. 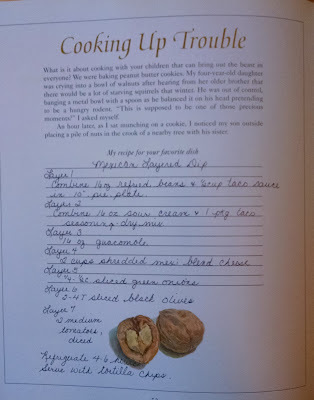 It is a recipe I wrote down after years of perfecting it. It is a combination of about three recipes. I would make this in the shape of a pumpkin for Halloween, using the tomatoes and olives for the face; a Christmas tree for Christmas time decorating the 'tree' with the tomatoes and olives. I would make it as a treat to eat while watching Saturday afternoon college football games, for Super Bowl Sunday, and for Halo XBox game nights at our house. It was always requested by Travis for our tree trimming party. I knew this was the recipe the minute I saw this page. I only wish I had a picture of Travis and I making it together. Journaling in Travis' book was something that took some time to complete. Some of the pages were filled with facts and completed easily. Some pages found me digging deep in my memory bank and recording stories I forgot about long ago. Some pages required emotional honesty, sharing experiences I had never shared with Travis before. Those pages found me taking a break and reflecting on what I wanted to say. Every page is completed in my handwriting. Some pages have copies of my favorite pictures. Every page is filled with love. It is a book that Travis will keep forever as a reminder of how much he is loved and how I cherish every day, every moment and every second that I had with him. I am proud to be his mother. I had to chuckle at a promise at the bottom of one page. I felt it was a good reminder of the type of mother and mother-in-law I hope to be. I just had to highlight it. It is with sincere hope that I fulfill this promise each and every day. 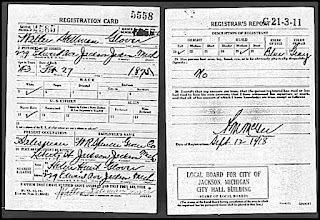 Source: "World War I Draft Registration Cards, 1917-1918," [database on-line], Ancestry.com (www.ancestry.com : accessed 23 July 2014), entry for Walter Stillman Glover, serial number 4585; United States, Selective Service System. World War I Selective Service System Draft Registration Cards, 1917-1918. Washington, D.C.: National Archives and Records Administration. M1509, 4,582 rolls. Imaged from Family History Library microfilm. World War I draft registration cards are one of the sources I enjoy looking at. The card doesn't look like it would contain much information, but it does. The card for Walter Stillman Glover provided his address, birth date, occupation, place and address of employment. nearest relative, her address, his signature and a description of Walter's looks. Walter Stillman Glover was the youngest of ten children born to Samuel Stillman Glover, Jr. and Adeline Dyer Glover. He is my great grand uncle. Walter was born 27 February 1875, which matches what I had found previously. Although this information wasn't on the draft card, Walter was born in Manistee, Manistee, Michigan. Walter lists his nearest relative as Helen Hunt Glover, who was his wife. Walter and Helen Hunt were married 25 October 1897 in Jackson, Jackson, Michigan. The information for Helen included her maiden name which was a nice find, which allowed me to find additional information about their wedding. The date of this record was 12 September 1918. Walter died less than two years later on 5 February 1920 in Jackson. Address: 229 Edward Ave., Jackson, Jackson, Mich. The lyrics of Sunrise, Sunset from Fiddler on the Roof, flow through my mind today. My little boy is getting married today. As the song says, I don't remember growing older, when did they? Travis hasn't lived at home since he graduated from college in 2009, but today I am a bundle of emotions. I am happy that Travis found the love of his life in Alayna. I am happy to be celebrating their special day with them. In their honor, I will share a few pictures of there growing together as a couple. 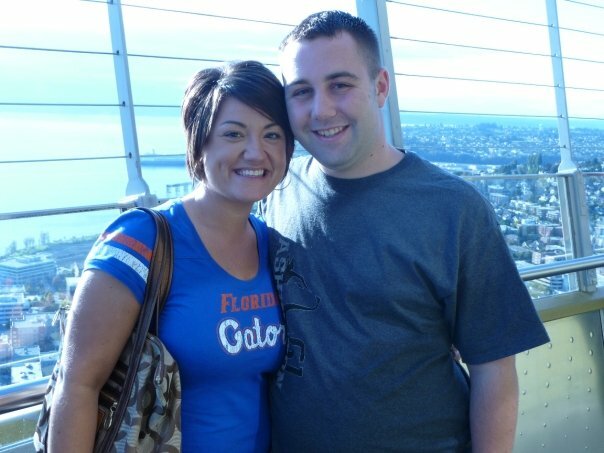 She took a chance and traveled to Seattle to get to know him. 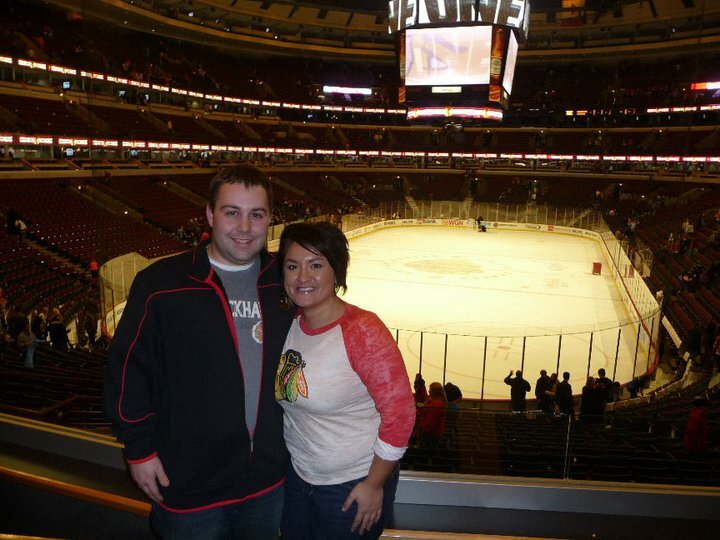 Making a Blackhawks fan out of them both! A great, young and successful couple. At a friend's wedding and now it is their turn. Dearest Travis and Alayna. I wish you all the joy and love one could possibly have. You are a great couple, you deserve it. A Time I Will Never Forget- I am a Survivor! It isn't very often that I write about my personal life on this blog, but I have a very important anniversary today and want to share it with my readers and future generations. Thirty five years ago I had a major life event that could have changed how my life turned out. Thankfully, it didn't but it did make me see life in a more precious way. I had graduated from college at the age of twenty-one. I was looking forward to changing the lives of children through teaching. I couldn't wait to get a teaching job. I was ready, I had the degree and the certificates. I just needed a job. I couldn't find a teaching job my first year out of college, but I could substitute teach. I enjoyed substitute teaching and I think it helped me become a better teacher because you never know what will be thrown at you during the day. The same year I graduated from college, I had a broken engagement. I was living in the same town as my fiancé at the time. My dad kept telling me I should come home to live and save money on rent. I could substitute teach at home. I didn't want to move back home because I thought of it as a failure. In January of 1980, I decided to move home. It probably saved my life. I spent the winter of 1980 sick, I couldn't get over a cold. My pierced ears would bleed and my nose looked like raw meat. I kept going to the doctor because I could not get better. I was substitute teaching in elementary schools and I figured I was picking up every bug out there. One April day I went back to the doctor and he discovered a lump on my neck. He asked, "was this here last week?" I said I don't think so. He wanted to send me for more tests; mainly, a thyroid scan. He said I might have cancer. That shocked me to my core. Never once did I think I had anything seriously wrong. The scan would have to be done at a hospital about thirty miles away, in Bad Axe, Michigan. I remember the day so clearly when I went to get my scan done. My mother had offered to go with me, but I said no I am fine, they aren't going to tell me anything today. I was up early and off to Bad Axe, a place I had been to many times in my teen years. It is where I would go shopping, or to the movies. It is where I had my senior pictures taken. I knew right where I was going. I got in the car that morning and turned on the radio. The Iran hostage crisis filled the airwaves. The day before, April 24, 1980, President Jimmy Carter sent helicopters to the Tehran, Iran embassy in an attempt to rescue the 52 diplomats that were being held. The helicopters were unsuccessful in their attempt. The Iran hostage crisis had filled newscasts since November, 1979, when the diplomats were first taken hostage. This was before the days of the 24 hour news cycle. It was big news for the time. Many people remember where they were during important news times, such as when JFK was killed. I remember where I was on the Friday morning, April 25, 1980 when the news of a failed Iran hostage rescue reached the United States. I was driving to get a thyroid scan. It was a morning that no one could have predicted what was about to happen. I arrive at Huron Memorial Hospital eager to get the tests over with. I didn't have a clue what those test results would uncover. The thyroid scan involved lying on a table, having an IV put in my arm that contained the radioactive iodine used for the scan, and having to tip my head back. I would guess this took about a half hour to complete. I remember the technician came back once during the scan to see if I was okay, which I was. The scan was completed and I was told I could get dressed and the technician would meet me in the hallway. The technician took me to a consultation room where a radiologist was waiting for me. Now, I recognized the radiologist because when I was in high school I took a Health Occupations course where we did rotations in the hospital and one of those was in radiology. This radiologist came to the hospital in Harbor Beach, once a week. I just remember thinking he wasn't very nice and didn't have good bedside manners. Now, I had to sit in a room alone with him and get my test results! The radiologist had my results and started talking about cold and warm areas of the scan. I was thinking, I am not going to have to wait a week to find out what is wrong with me. The radiologist proceeded to tell me that there was an area of my thyroid that was cold, meaning it didn't absorb the radioactive iodine and that meant that I had thyroid cancer. Oh my god! The "C" word. I knew it was a possibility, but I was stunned. I asked the radiologist what was next and he said he would send the results to my doctor, but it would mean I would have to have surgery to remove the cancerous thyroid. I left the consultation room and the first people I saw were neighbors. If you have ever lived in a small town you will know that you don't want to see neighbors after you get bad news. I tried to cover my reaction to the news and just said hi, and went on my way. I got in the car to drive home. I made the turn from M-142 to M-19 to go home and I had to pull over to the side of the rode to cry. I was devastated. I had cancer! I believe there are moments in your life when God is very present and I believe that God was present the spring of 1979 when I was selecting classes for Spring term at Western Michigan University. One class I took was Cancer Education. Less than a year later, I was needing it myself. I relied on my education that morning on the side of the road as I blubbered about having cancer. I think it was at that moment I decided I was going to fight this. Nothing was going to get the best of me. I remember getting home later that morning. I had things to keep me busy. I had phone calls to make because I was helping to plan our five year class reunion. I was on the phone and there was a knock at the back door. It was the elementary school secretary. Remember, it was a small town. She had been trying to call to see if I would like to substitute teach for the afternoon. I said yes. I was 22 at the time, what did I know about taking time to process things. I arrived at school, which was the school Kirk, my boyfriend and eventual husband, taught at. He asked me in the teacher lounge in front of other people how my scan went. I said it went well. I was not ready to share my news in a public format. It wasn't until recess time when Kirk came into the class room I was in, that I shared my news. Of all the people that I told throughout the whole ordeal Kirk was the most compassionate and understanding. I had already fallen in love with him, but if I hadn't this would have sealed the deal. The fact that he stuck with me and asked me to marry him five months later proves it. Now, the waiting began. Waiting to hear from the doctor, waiting to go to an endocrinologist for a needle biopsy, waiting to schedule surgery. I think this was the most stressful time of the whole ordeal. I called my doctor's office because I wanted to discuss what the radiologist told me and couldn't get beyond the receptionist. I wasn't going to tell her, it would have been all over town before I could hang up the phone. My doctor called me one week later in the evening. He didn't tell me anything I didn't already know. I am thankful that my doctor was fairly young and completed some of his training at Henry Ford Hospital in Detroit, Michigan, because he recommended I go there. He did give me the option of having it done in Bad Axe, but I knew enough to know I wanted to go where they treated this often. He said he would make the referral and I would be hearing from his office soon. The referral was made to a Dr. Miller at Henry Ford Hospital. I loved Dr. Miller from the moment I saw him. He was kindest, gentlest doctor I have ever had. I didn't know it until much later, but he was friends with my Uncle Hank and Aunt Mabel Glover. Dr. Miller performed the needle biopsy and the rest as they say is history. The results came back as papillary carcinoma of the thyroid. I did indeed have cancer. The treatment for papillary carcinoma is surgery. The surgery was scheduled for July 2, 1980-thirty five years ago today! Dr. Ansari, another awesome doctor, performed the surgery. I was admitted to the hospital a few days ahead of time and remember going through all kinds of tests. Dr. Miller, my endocrinologist, even came to my room a couple of times and went with me to the tests. I remember being in the elevator and it was just Dr. Miller and I. I am in my robe heading to one test or another, and he said the most important thing I could have done was to have the surgery at a good hospital and I had picked a good one. He said it was important because it increased the chances that it would all be removed and I would have a great recovery. He said if you have to have cancer, thyroid cancer is a good one to have as it is almost 100% curable. I don't believe any cancer is good cancer, but I was cured and I am here today to say I am a survivor. I don't have a lot of memories about the day of the surgery except I am waiting in a dark hallway to go the the surgical room and there was a chatty Cathy asking me what I was having surgery for. She was having knee surgery. My surgery was successful. I woke up in my hospital room and was frustrated because I couldn't open my eyes, they were stinging. I slept most of that day. The nodule was 2 cm and the cancer had spread to my lymph nodes. I had a total thyroidectomy with two of the four parathyroids and many lymph nodes removed. Dr. Ansari, the surgeon, told me they removed many more lymph nodes than necessary and would test them to make sure the margins were clean, meaning all the cancer had been removed. I was discharged on July 4th. Kirk came to take me home. I had to return to Dr. Ansari's office a week later for a check up. It was here where I learned he had gotten all the cancer. The extra lymph nodes were clear. I would not need radiation or chemotherapy. I would need to return in four months for a scan, just to be sure they had gotten all the cancer. The scan in November of that year was clear and I haven't had a re-occurrence of the cancer. The cancer was gone. I am on thyroid replacement medicine and other than an occasional high or low thyroid blood level I have been healthy. I look back on the time when I was dealing with this and wonder how I would handle a cancer diagnosis now. I had the invincibility of youth at the time. Nothing was going to get to me. I was going to fight this and be successful at it. I remember one of the young residents telling me I had such a great attitude and that a positive attitude would help me beat this diagnosis. I didn't know anything else. Today, July 2, 2015 I celebrate life! I am a cancer survivor. I am one of the lucky ones. I wish all cancers would have the prognosis that I had. I have three very special doctors to thank for my life: Dr. Moi, Dr. Miller and Dr. Ansari. Thank you for your kindness, your care, and your expertise. You were all there at the right time with the right knowledge and because of you I am here today to celebrate.